I've been on a quest to become a weather watcher for our local NBC News Channel 8. Each weekday morning when meteorologist Jennifer Hill gives her forecast, she announces the current temperatures that her weather watchers are experiencing in different cities throughout the Tampa Bay region. I am a fan of their Facebook page, so one day I posted a comment to the effect of "Wouldn't it be fun to say on the air... and Big Monkey in Crystal Beach has 63 degrees?" Jen, being the COOLEST meteorologist around, said that she would love to announce my temperature. My first report was yesterday. I woke up before 5:00 am (when the morning show begins) and provided my information. Low and behold, within the first half hour Jennifer announced my forecast, and then she even said that if the viewers want to see pictures of Big Monkey, they can go to the News Channel 8 Facebook page! I have previously posted several fan photos on their site. Laura is lamenting the fact that she did not record this on the DVR to preserve my first forecast for eternity. This is very exciting stuff in my world! The next update involves Kathie Lee and Hoda. The pictures in my blog posts from 2/17 (Honeymoon Island) and 2/22 (Margarita Day) featured the Kathie Lee and Hoda paper cut outs. I sent these photos to NBC hoping they would display them on the air. Yesterday Laura and I were watching Thursday's show which we recorded. I was delighted when they showed the picture of me and Mr. Monkey in the Escalade driving on the beach with KL and H. During a later portion of the broadcast, there was my Margarita Day photo! I had one teeny problem with that though. 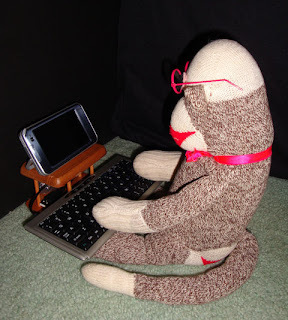 They called me Mr. Monkey instead of Big Monkey, just a small oversight on their part. Last night I discovered that these photos were posted on Kathie Lee and Hoda's new web site, as well as a third photo where the girls were admiring my bod on the beach! Click HERE to see my work. What an exciting day! What will the next week will bring? All I know is that I'm going to be taking lots of brand new pictures to thrill my audience. This was my friend Bobo who lived a short yet vibrant life for a month or two. He made a lasting impression on me, and I won't ever forget him. 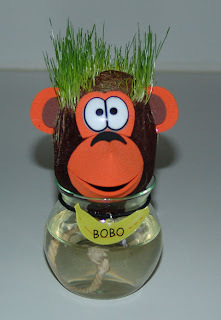 It's been about a year since Bobo's departure to the great monkey farm in the sky. He was lovingly crafted out of coconut husk, which unfortunately led to his early demise. Bobo did not let it bother him that he only had a head (no body, arms or legs). He always wore a smile, which is what endeared him to me and my entire family. 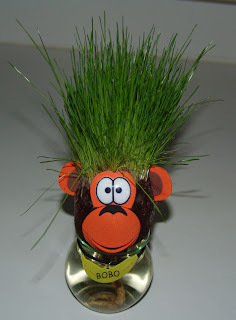 Bobo came to us bald, but his head contained some miracle seeds which made him grow hair! 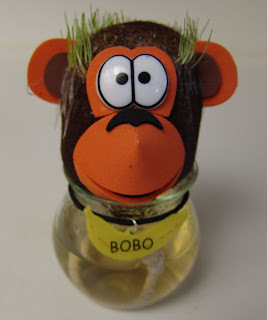 Here's the first stage of Bobo's growth. It resembles human male pattern baldness. The existing sprouts continued to grow in length as time went on. Then he magically filled in and had a full head of hair. What a miracle! He only needed more water in his dish to thrive, not Rogaine like the humans use. 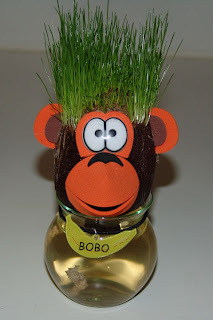 Bobo's growth continued unchecked (see below), until Laura and Mark gave him a haircut. I'm not including any subsequent pictures because I don't want to showcase his decline. Bobo just needs to be represented during his glorious golden age. He finally succumbed to some strange mold, which permeated his entire skull. It was not pleasant to see or smell. Bobo became very sad, and he lost his smile. Then it was all over. After his cremation, I retained his personalized banana necklace as a memento of better times. R.I.P. my friend. It's Mardi Gras in Crystal Beach. I'm living large on Fat Tuesday! 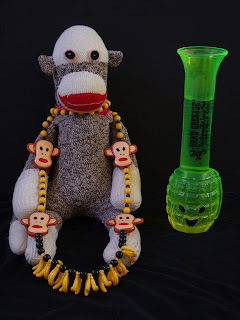 Here I am posing with my authentic New Orleans monkey head and banana beads. That's an infamous hand grenade drink next to me. Anyone who's been to Bourbon Street probably knows the effects of this unique concoction. Here's a random shot from Laura and Mark's visit to New Orleans in 2005 (2 weeks before Katrina hit). 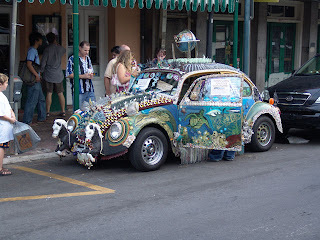 This Beetle sure is decked out! I think we should decorate Laura's Blueberry like this. Ha ha! The first item being modeled by my assistant Laura is the "You Had Me At Hello" t-shirt. 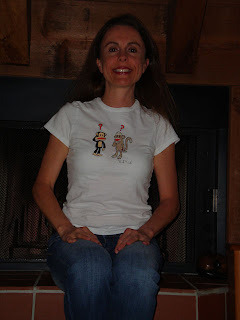 It was created by a famous designer named "Sock Monkey" which is imprinted on the back of the neck. This statement shirt incorporates nostalgia from the famous movie Jerry Maguire. The second piece in my show is made by the fabulously famous entrepreneur Paul Frank. 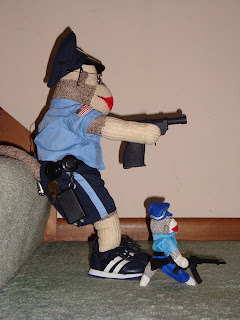 He's made it to the big time transforming the image of his childhood sock monkey into a lovable character named Julius. 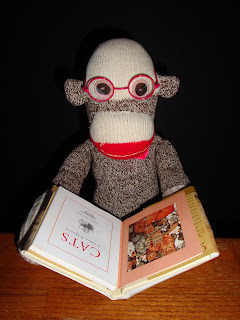 Julius meets Sock Monkey, and both of them ponder the uncanny similarities between their two separate existences. Pretty deep, huh? The following shirt has been created in the fashion house of Cracker Barrel. It says, "It's Hard To Be Nostalgic When You Can't Remember Anything." This designer is known for combining humor with a great sense of fashion. I've saved the best for last. This one-of-a-kind lavender long sleeve was created by ME! My image has been emblazoned on the chest area for all who view it to admire. The model has practically worn this one out, so I need to make a reproduction for her in the future. I have concentrated on couture for my brief stint in the fashion business, but I am contemplating the introduction of a large line of clothing (similar to Paul Frank) someday. I hope you enjoyed the show. My model and I thank you for your applause and support. 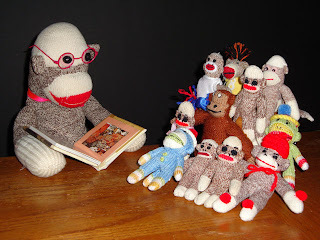 Welcome to the first installment of Big Monkey's Book Club. Today I am reading a fascinating book about cats. Reading to the little ones is very important. My captive audience is enjoying this cat story. In case you were wondering, no, I did not steal my glasses from Sally Jesse Raphael. Today is National Margarita Day, and I am getting this fiesta started early! I've got two lovely chiquitas, Kathie Lee and Hoda to celebrate with me. Don't you like our sombreros? Have fun and drink responsibly. Sorry, I had to put that in because I am a role model you know. I'm allowing you unprecedented access to my office work station. This is where all the magic happens. My computer is booting up, and I'm ready to create a new blog post. Big Monkey's House is up and running! 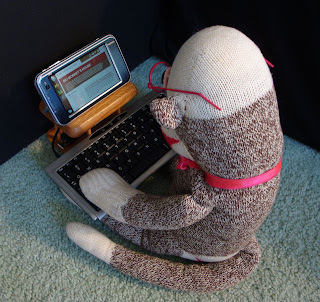 I'm burning up that keyboard as I type about my latest adventures. As promised, here is the video from the Today Show with Kathie Lee and Hoda which includes the soon to be famous, Ode to Hoda. When I sent them the poem, I mentioned that Farcus was the author, not me. Farcus was a little miffed that they said "Velike and Hoda" at the end of the video. He thought I was trying to steal his girl. I explained to him that it was just a misunderstanding. Kathie Lee and Hoda have issued a photo challenge to their fans. Bring a printed photo of us on your adventures and capture pictures of yourself with our photo. I decided to enjoy a day at the beach and take some photos for their challenge. The dialogue below accompanied my submission to NBC. 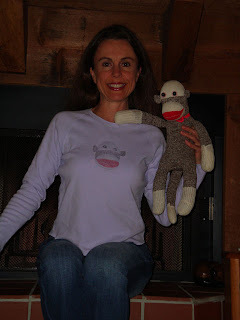 If they like it, you might just see me and Mr. Monkey on national television! 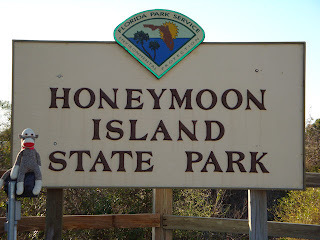 The four photos below were taken at Honeymoon Island State Park in Dunedin, Florida. 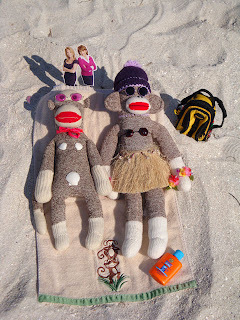 They chronicle a story about two fortunate sock monkey dudes who happen to meet two gorgeous babes (Kathie Lee and Hoda) while sunbathing on the beach. Big Monkey poses in front of the park's entrance sign. He's looking forward to a day of sun and fun at the beach with his pal, Mr. Monkey. Mr. Monkey, don't look now, but I think those two hotties are checking us out! Big Monkey shows off his fab physique (sculpted guns and six pack abs). Kathie Lee and Hoda admire the sock stud from behind. 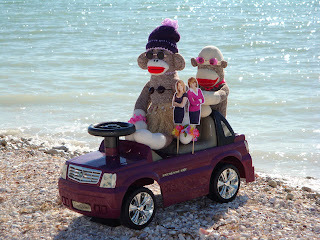 Mr. Monkey and Big Monkey invite the girls for a cruise along the beach in their super purple Escalade. 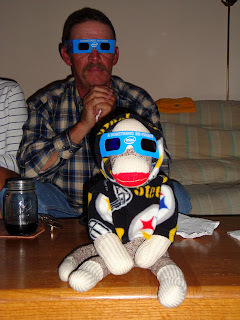 Go monkeys! Farcus has a crush on Hoda Kotb from NBC's Today Show with Kathie Lee and Hoda. He got really excited a few weeks ago when she casually mentioned that she liked red haired men. Farcus decided to do something special for Valentine's Day. He put his rhyming skills to work and wrote this heartfelt poem just for Hoda. The show's Facebook guru, Sara, read the poem aloud to Hoda last Thursday on the air. I think she was pretty impressed because she was laughing the whole time! The only problem is that Hoda thinks that I wrote it (my Facebook identity is Velike Ludorije). 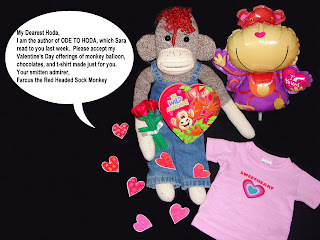 Hoda is under the impression that some human male named Velike has the hots for her! I sent a correction note to their Facebook page, along with the photo below. I certainly can't take credit for Farcus' special talent. I will soon post the video clip from the Today Show so you all can enjoy the poetry reading. Laura and Mark were looking through some old film camera photos, and here's a random sampling of what they discovered. 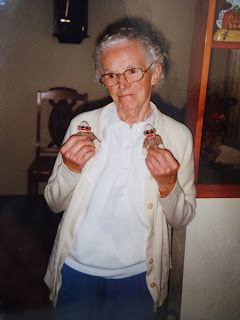 This is a picture of my mother (Mark's grandma) from 1997. She's holding two little sock monkeys - Socks and Neglected Monkey. 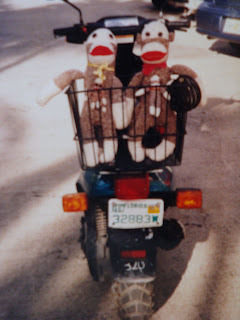 This picture is from a trip to Key West in 1998. My brother One Eyed Jack has TWO eyes in this shot. Obviously this was pre-vacuum cleaner accident where Laura sucked up his eye. Socks and my mini me, Little Big Monkey, are ready to go for a ride on this "hog" (scooter). Below is a picture of my first trip to Vegas earlier in the millennium. 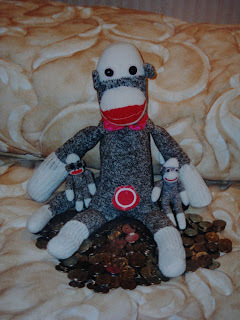 Socks, Little Big Monkey and I are reveling in our massive slot machine winnings. I can't remember what the red sticker with the white circle is about. What happens in Vegas, stays in Vegas. 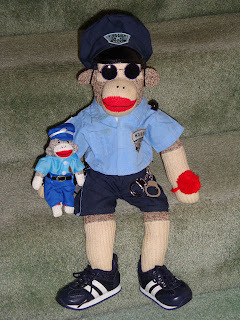 Look what the sock stork brought Officer Po Po. It's his baby son, Po Junior! Proud Papa Po Po is wasting no time raising his mini me rookie cop. He's already equipped with his own uniform. Teaching the youngster how to operate his firearm is key to his future success as an officer. Po Po demonstrates the proper technique while Junior mimics his mentor. 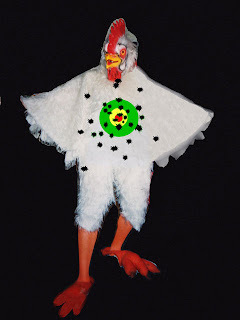 The target for their shooting practice is this unfortunate chicken. Can guess this poultry's identification? I couldn't have asked for a better 2008 football season. All good things must come to an end, unfortunately. We enjoyed watching the Pro Bowl in Hawaii yesterday - the final game of the season. 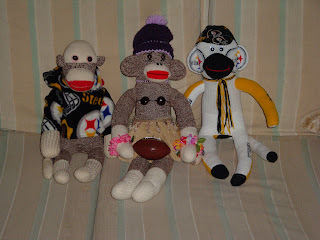 Mr. Monkey really got into the spirit of the day by donning a grass skirt, coconut bra, and leis on each wrist. Ben Socklisberger took some time out to hang with us after his whirlwind week post-Superbowl. There's another group of monkeys on the loose in a neighboring county. They were successfully outsmarting their human captors until the grapes lured them in, but I won't spoil the story for you. Check out this link Escape from Monkey Island. Make sure you turn the sound up so you can hear the monkey music that accompanies the animated story. Also, you must continue to click the word "Next" beside the little monkey until you reach the end of the story. I promise that you won't be disappointed. This is high quality entertainment. You'll be rooting for these cute little fellows! You might remember when I announced my Facebook profile under the name "Velike Ludorije" which is my name translated into Croation. I recently joined the Facebook fan club for The Today Show with Kathie Lee Gifford and Hoda Kotb. These ladies regularly discuss and share their fans' postings and photographs on their live television show which airs at 10:00 am (depending on location) on NBC, Monday through Friday. I've been diligently following the show, making relevant comments, and uploading some of the photos you've seen on my blog to their Facebook fan site for about a week or two. The odds of me getting noticed are pretty slim, since there are thousands of people doing the same thing. One day Hoda, Kathie Lee and their assistant Sarah were dancing to a song by Beyonce called "Single Ladies (Put A Ring On It)". As a side note, I also learned that Hoda and her family are Pittsburgh Steelers' fans. Last weekend, my cousin had posted a parody song "Steeler Ladies (Put A Ring On It)" on her Facebook page. 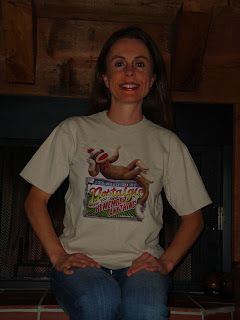 I also posted a link to the song on my blog post dated 1/31/09. I had a light bulb moment and thought that maybe if I forwarded "Steeler Ladies" to Kathie Lee and Hoda, they might like it and play it on the show. Laura records their program daily, and Monday evening we were watching the show from that morning. We both nearly fell off the couch about 10 minutes into the program. If you want to find out why, just click the Play arrow below. My pal Billy Ground Hog arose early this morning for his most important mission of the year - to determine whether or not we will experience 6 more weeks of winter. As he emerged from his burrow inside this log, Billy Ground Hog clearly saw his shadow. His outfit which included a snowman sweater and knitted cap also foreshadowed today's results (pun is intended). Don't shoot the messenger! 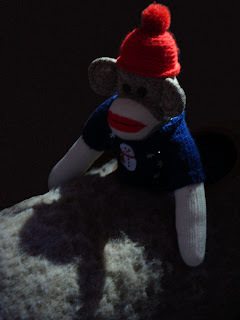 Billy is a pretty cool sock monkey. He also is a former pro football player, so I wouldn't agitate him if I were you. 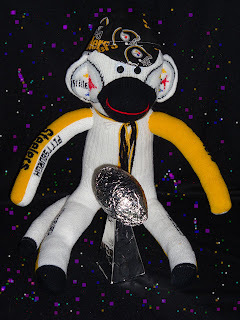 Ben Socklisberger is celebrating his team's victory in the Superbowl by posing with the Vince Lombardi trophy. Surrounded by floating confetti, this monkey has every reason to go ape! The game was a real nailbiter, but the Steelers came through in the end for all of their loyal fans. Here's the gang (from left to right: Karen, Bud, me, Scott and Mark). 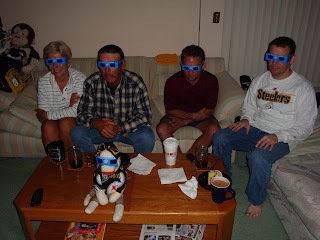 We're watching the halftime commercials wearing our 3D glasses. Bud and I think the 3D promotion was exaggerated. We've seen better 3D movies back in the 50's and 60's.